Archives for September 2010 | Your Health. Your Lifestyle. Electrolytes are molecules in your plasma – the liquid portion of your blood – that maintain either a positive or negative charge. These charges allow them to respond to messages from your nervous system by conducting electrical currents through your body, enabling and regulating many bodily functions and systems. Chloride is one of your body’s most important electrolytes. It is located in the extracellular fluid compartments – area outside the cells. Your body’s chloride levels are directly related to its sodium levels. It is very important that your body’s electrolytes – such as chloride, sodium, and potassium – remain at their proper levels. Electrolyte imbalance (which is also called electrolyte disturbance) can occur if any of these substances has a sudden, abnormal change. The change can be elevation or depletion of the electrolyte, and may be due to renal failure or water loss, such as from long-time laxative abuse or excessive vomiting, diarrhea, or sweating. Therefore, sufferers of anorexia and bulimia are at particularly high risk. Electrolyte imbalance is usually the result of an underlying problem, such as dehydration or dysfunction of the endocrine system or kidneys, and is usually corrected by treating the initial problem. If an electrolyte imbalance is left untreated, it can cause heart-related issues, organ failure, problems with the nervous system, or death. Chloride can exit the body through urine, sweat, or vomit, or from kidney or adrenal gland disease. Hypochloremia occurs when too much chloride exits the body, resulting in a deficiency. Although there are often no symptoms, some people experience headaches, nausea, or cardiac arrest. Others experience water loss and dehydration. Although there are often no symptoms, some people with elevated levels of chloride also experience dehydration, diarrhea, muscle tension, or kidney disease. Diabetics with elevated chloride levels have a very difficult time maintaining healthy blood sugar levels. There is usually an underlying cause of this disorder, and treatment should involve pinpointing and treating this problem. Most people get a majority of their chloride from table salt or sea salt. (Salt also contains potassium and sodium). Chloride can also be found in the foods – celery, lettuce, olives and tomatoes. Because salt is so common in most of diets, it is usually not necessary to take supplements or eat more salt-containing foods. However, some people do need to add salt to their diets. People with adrenal failure, for example, need to increase their salt intake. Your healthcare provider can help determine whether or not you need more or less salt in your diet. Any excess of chloride is usually removed from the body in urine. However, be cautious about consuming too much salt, which also contains sodium and potassium, and may contribute to muscle cramps, heartburn, dizziness, high blood pressure, or even electrolyte disturbances in people who are susceptible to this condition. Many vitamins and enzymes need a mineral co-factor to function properly. The USANA Vitamins Chelated Mineral supplement is a carefully USANA formulated balance of essential minerals and ultra trace minerals sourced from the highest quality suppliers in forms readily absorbed by the body. Choline is an important nutrient that plays a role in almost every bodily system. The important compounds acetylcholine and lecithin are derived from this B vitamin. Acetylcholine is believed to protect against certain types of age-related dementia. Diseases/disorders that can be treated with choline – Alzheimer’s disease, hepatitis, high cholesterol, liver disease and manic depression (bipolar disease). Inositol is part of the vitamin B complex. It helps synthesize phospholipids, which are essential to the digestion, absorption, and transportation of fats in the body. Sufficient amounts of inositol are vital for good health – both mental and physical. •	Used to treat depression and panic disorders. Vitamin C must be consumed in food or supplements because it cannot by made by our bodies. This water-soluble vitamin is essential for many of your body’s system to function properly. The immune system, in particular, relies on vitamin C. Rutin, a bioflavonoid, inhibits the oxidation of this vitamin, making it more useful to the body. If you are diabetic, you need to take vitamin C. This is because vitamin C and glucose enter your cells through the same pathways. Consequently, vitamin C will be competing with glucose to enter your cells – and glucose will win, leaving the cells deficient in vitamin C.
Symptoms of Vitamin C Deficiency – bleeding gums, cardiovascular disease, easy bruising, fatigue, frequent infections, impaired wound healing, joint pain, loose teeth, scurvy and weight loss. Doses of Vitamin C higher than 5,000 milligrams can be ingested, but may cause diarrhea. Mineral ascorbates and Ester-C are buffered forms of vitamin C that cause less diarrhea. Vitamin C is water soluble and leaves the body quickly, so it should be taken twice a day. Therefore, you should take 500 to 2,500 milligrams of Vitamin C twice a day. Hemochromatosis occurs when the body accumulates excess iron. Vitamin C can increase this accumulation, so people with hemochromatosis should avoid taking extra vitamin C. If you have a glucose-6-phosphate dehydrogenase (G6PD) deficiency, do not have vitamin C given to you intravenously. USANA Vitamins Proflavanol C100 employs USANA’s innovative Nutritional Hybrid Technology. USANA is among the first in the supplement world to use Nutritional Hybrid Technology. Like the other elements of the vitamin B complex, B5 – pantothenic acid – is involved in the body’s metabolism of carbohydrates, fats, and proteins. It is named “pantothenic”, which is derived from a Greek word that means “everywhere”, because this vitamin can be found, albeit in small quantities, in many, many different foods. Dosage – 50 to 250 milligrams daily. B vitamins are water soluble and leave the body quickly, so they should be taken twice a day. Therefore, you should take 5 to 125 milligrams of B5 twice a day. Diseases / disorders that can be treated with B5 – acne, adrenal dysfunction, allergies, cold sores, detoxification, elevated triglycerides, genital herpes, fatigue, infection, osteoarthritis, rheumatoid arthritis, shingles and ulcerative colitis. Pyridoxine acts as a partner for more than one hundred different enzymes. As you get older, the efficiency with which you utilize B6 decreases, so it may be necessary to increase your intake of B6 as you age. Symptoms of B6 deficiency – depression, fatigue, hyperactivity, insomnia, irritability, mental confusion, mouth ulcers, nervousness, numbness, skin lesions around the mouth and weakness. At too high a dose (more than 500 milligrams a day), pyridoxine can cause a neuropathy (nerve disorder). If you are taking levodopa for Parkinson’s disease, do not take B6 without first consulting your doctor. Also, high dose supplementation of a single B vitamin can cause imbalances of other B vitamins. Diseases / disorders that can be treated with B6 – asthma, atherosclerosis, autism, carpal tunnel syndrome, constipation, depression, diabetes mellitus, eczema, epilepsy, infertility, irritability, monosodium glutamate (MSG) sensitivity or intolerance, nausea and vomiting related to pregnancy, nervous system dysfunction, osteoporosis, premenstrual syndrome (PMS), prevention of calcium oxalate kidney stones, schizophrenia, seborrheic dermatitis and sickle cell disease. Vitamin B2, or riboflavin, is very much involved with your body’s energy processes, as well as many other processes. It is vital, for example, for healthy eyes, the production of antibodies, and proper tissue repair. 10 to 100 milligrams daily. You need more B2 during illness or athletic training. B vitamins are water soluble and leave the body quickly, so they should be taken twice a day. Therefore, you should take 5 to 50 milligrams of B2 twice a day. High doses supplementation of a single B vitamin can cause imbalances of other B vitamins. Vitamin B3, include both niacin (or nicotinic acid) and its derivative niacinamide. The lists below, however, refer to niacin, a vitamin made from tryptophan, B6, B2, and iron. It is used in at least forty chemical reactions in your body. Niacin has shown to have positive effects on cholesterol levels, particularly when used in conjunction with a statin drug. However, taking niacin by itself may result in increased homocysteine levels. 50 to 3,000 milligrams daily. However, see your doctor if you want to consume doses greater than 100 milligrams. If you find yourself needing more niacin, try taking NADH, a reduced form of vitamin that is also more active B vitamins are water soluble and leave the body quickly, so they should be taken twice a day. Therefore, you should take 25 to 1,500 milligrams of niacin twice a day. When you are first beginning niacin treatment, it is fairly common to experience skin flushing, sensations of heat, stomach problems, or dry skin. However, these reactions typically subside within several weeks. Also, taking an aspirin 30 minutes before supplementing with niacin can help prevent skin flushing. High doses of niacin or extended-release niacin can cause liver damage, peptic ulcers, high uric acid levels, or glucose intolerance. Do not take niacin without taking the other vitamins in the B complex because doing so can cause your homocysteine levels to elevate, increasing your risk of heart disease and memory loss. If statin drugs (which lower cholesterol) and niacin are taken together, rhabdomyolysis (a potentially fatal breakdown of skeletal muscle) may occur. Therefore, niacin should only be taken under the supervision of a doctor. Acne, depression, diabetes mellitus, high cholesterol, high lipoprotein(a), high triglycerides, intermittent claudicating (leg pains due to circulation changes), low HDL (good) cholesterol, memory loss, osteoarthritis, painful menstrual cycles, Parkinson’s disease and rheumatoid arthritis. USANA Vitamins HealthPakTM includes the Essentials™, pre-packed in convenient AM and PM pouches. 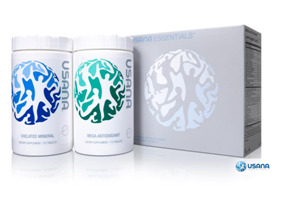 Provides the full daily dose of the top-rated USANA Essentials (Mega Antioxidant and Chelated Mineral), includes Active Calcium™, a core USANA Optimizer and USANA’s unique AO Booster™ for added antioxidant protection. The food you eat can affect the medication you are taking. You should be aware, for example, that grapefruit can increase the risk of side effects from a wide variety of drugs. The side effects described below can occur from eating grapefruit while on the specified medications. •	Grapefruit can cause flushing, headaches, and increased heart rate if eaten while taking calcium-channel blockers (such as nifedipine, amlodipine, verapamil, and felodipine), which help decrease blood pressure. •	Grapefruit increase quinidine levels. •	Grapefruit can cause irregular heart rhythms if eaten while taking the antihistamine terfenadine. •	Grapefruit can increase levels of benzodiazepines (sedatives that include alprazolam, diazepam, midazolam, and triazolam). •	Grapefruit can cause kidney and lvier toxicity if eaten while taking cyclosporine. •	Grapefruit increases caffeine levels and can cause nervousness and insomnia. •	Grapefruit can decrease the absorption of macrolide antibiotics such as clarithromycin. •	Grapefruit can decrease the absorption of the antihistamine fexofenadine (such as Allegra). •	Grapefruit can increase the medication level of HMG-CoA reductase inhibitors (statin drugs). •	Grapefruit can delay the absorption of Viagra, a male impotence medication. •	Grapefruit can cause hives if taken with the pain reliever naprosyn. •	Grapefruit can increase certain levels, which may lead to nausea, tremors, drowsiness, dizziness, or agitation, if eaten while taking carbamazepine (such as Tegretol). •	Grapefruit may elevate blood levels and cause nausea, drowsiness, tremors, or agitation if eaten while taking amiodarone. •	Grapefruit can increase estrogen levels in both men and women. No interaction with medication is necessary for this to occur. USANA Vitamins Proflavanol® C100 is USANA’s groundbreaking bioflavonoid and advanced vitamin C supplement. Vitamins and minerals can interact with each other, as well as with other nutrients. These relationships and interrelationships can have various effects. The following examples show how certain vitamins and minerals interact. •	A certain amount of vitamin C is necessary for your body to use selenium effectively. •	Vitamin C can enhance the availability of vitamin A. •	Too much zinc can decrease calcium absorption. •	Vitamin D increases the absorption of calcium and magnesium. •	Vitamin D helps your body use zinc effectively. •	Too much copper can decrease the uptake of manganese in your system. •	A vitamin A deficiency can decrease iron utilization. •	Too much iron can lower your manganese and copper levels. •	Too much vitamin B2 (riboflavin) can cause a magnesium deficiency. •	Vitamin B6 can cause a decrease in copper absorption. •	A vitamin E deficiency can decrease absorption of vitamin A. •	A vitamin B6 (pyridoxine) deficiency can lead to a decreased use of selenium. •	Adequate phosphorus intake is needed to maintain vitamin D.